The Most Reverend Daniel Thomas, bishop of Toledo, speaks with Terrie Joyce, a parishioner of Holy Family Catholic Church in Manayunk. Thomas grew up in the parish. A surge of cheers arose from a crowded reception hall at Holy Family Catholic Parish in Manayunk the moment Bishop Daniel Thomas entered the room Wednesday night. Once again, Thomas was back at the parish where he grew up. But this homecoming reception differed significantly from previous trips home. Thomas brought 150 pilgrims from the Diocese of Toledo, where he was appointed bishop in August 2014, to Philadelphia for the World Meeting of Families and the papal visit. 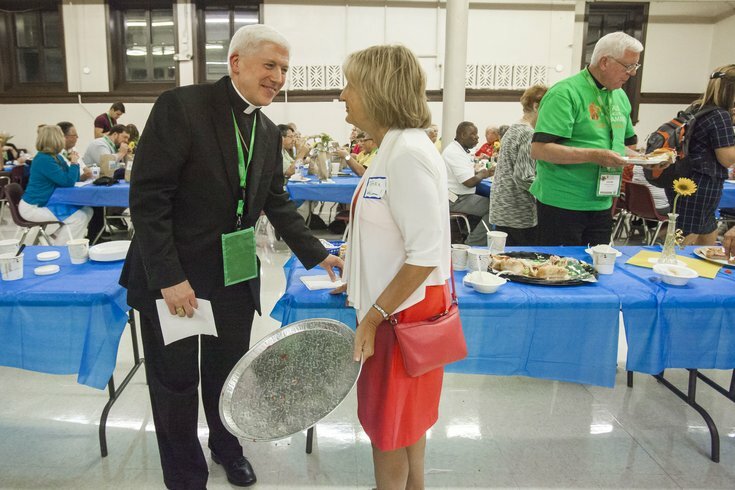 The reception hall was packed with a mixture of people Thomas had inspired – Toledo pilgrims, Holy Family parishioners and visitors from Our Lady of the Assumption Parish in Strafford, Chester County, where Thomas served seven months as pastor. "For anyone, coming home is always a blessing," said Thomas, 56. "To be able to bring the folks from my new home in the Diocese of Toledo to my first home in the Archdiocese of Philadelphia – the place of my birth and the parish of my birth – is a tremendous gift." A 1977 graduate of Roman Catholic High School, Thomas attended St. Charles Borromeo Seminary in Lower Merion and was ordained a priest by the Archdiocese of Philadelphia in 1985. He later served 15 years in Rome as an official of the Congregation for Bishops at the Holy See. He returned to the Philadelphia region in 2005, briefly pastoring Our Lady of Assumption before becoming auxiliary bishop of Philadelphia in June 2006. Now in Toledo, Thomas holds the unique perspective of intimately knowing Philadelphia while also having an outsider's view of the pope's visit to his hometown. "The archdiocese has endured a tremendously difficult time and I think this is a transformative moment for the Archdiocese of Philadelphia," Thomas said. "I had the grace and blessing of trying to assist in that transformation, assisting Archbishop (Charles) Chaput. I think he's done extraordinary work for the local church. I think, now, a papal visit will be all the more transformative for us." Pope Francis will spend two days in Philadelphia, making varied public and private appearances. They will be capped by a Sunday afternoon Mass expected to draw some 1.5 million people to the Benjamin Franklin Parkway. All week, the World Meeting of Families has been abuzz with excitement generated by the upcoming papal visit. Maintaining the spark created by Pope Francis, Thomas said, is the responsibility of every Catholic. "I think the job of every Catholic is to build on the good will and the grace that he brings, so that they would be themselves more faithful disciples," Thomas said. "One of our visions for the Diocese of Toledo is that we're trying to form holy disciples, holy families and holy vocations." Thomas arranged for a diocesan pilgrimage to Philadelphia for the World Meeting of Families and papal visit. A group of 150 pilgrims arrived with him at the start of the week. Another 150 arrived Thursday. In addition to taking part in the World Meeting of Families, the group visited The National Shrine of St. John Neumann at Fifth Street and Girard Avenue, and the Shrine of the Miraculous Medal in East Germantown. As the group bused around Philadelphia, Thomas pointed out various sites significant to either his own upbringing or Philadelphia history. "We have so much affection for him, but we've only just met him in the past year," said Monica Martinez, who serves as the Diocese of Toledo's director for the Marriage and Family Life Office. "Coming back here, we get to see more of who he is. It's really touching. It makes me a little bit emotional. It's just really neat to see his life and his family coming together." Speaking at a Wednesday evening vespers service, Thomas told how his late parents became engaged. Kneeling before the crib at a Christmas Eve service at Holy Family, his father silently slid a box to his mother. "In front of baby Jesus, with tears in her eyes, she turned toward him and he said, 'Well?'" Thomas said. "She said, 'Yes.' He said, 'Merry Christmas.'" Thomas asked God to bless families throughout the world, including those gathered with him, during his five-minute address. Thomas spoke often of his family when giving homilies at Our Lady of the Assumption, said Phil DiGiacomo, one of about 15 parishioners who traveled to Holy Family for the reception. "He was such a gifted homilist," DiGiacomo said. "Each week, with whatever he was talking about, you were riveted. He was succinct but he always managed to deliver a homily that commingled the world today with that particular weekend's scriptures." Thomas credited Holy Family for planting the seed for his vocation. Nora Jefferson, a Holy Family parishioner who helped organize the reception, recalled Thomas participating in variety Catholic Youth Organization activities, including portraying "a great Charlie Chaplin" during one show. Thomas remains popular among his home parish, which has hosted previous gatherings for him, including one when he was named bishop. "When we found out he was coming here, everybody was very happy," Patterson said. "It didn't take much to get people to volunteer to come help." Thomas is seemingly enjoying a similar popularity in Toledo. Joe Malenfant, a deacon who will help serve communion during the papal Mass, has been impressed by Thomas' authenticity. He said so many Toledo parishioners followed Thomas to Philadelphia because they love him. "He's really a man of the people," Malenfant said. "He's tireless in his work. You get the sense he loves his people and loves Jesus Christ."